Here is a bread-based dessert adapted from Carol Field’s book [/books/collections/allbooks/theitalianbaker "The Italian Baker"]_. It’s a basic, moist bread pudding that doesn’t call for any hard-to-find ingredients. I’ve served this pudding with only a dusting of powdered sugar and a squeeze of lemon juice. 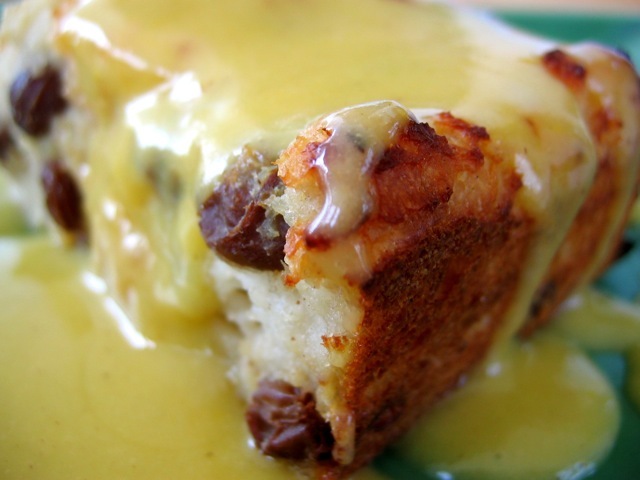 But if you served this with a sauce, such as crème anglaise, it would be a truly rich dessert. Trim the crusts from the bread. Tear or cut the bread into 2-inch pieces and put them in a large mixing bowl. Heat the milk, butter, and sugar just to a boil, then pour the mixture over the bread. Set aside for 2 hours, occasionally pushing down the pieces of bread to immerse them in the milk. Meanwhile, put the raisins and bourbon in a small bowl and add warm water to cover. Let stand until the raisins are plump, about 20 minutes. Drain well. Preheat the oven to 375 degrees. Generously butter a 2-quart baking dish. Squeeze the excess milk from the bread and break it up with your hands. Mix in the raisins, eggs, lemon zest, cinnamon, and vanilla. Pour the bread mixture into the prepared pan. Bake until the top puffs up slightly and is a light golden brown, about 30 to 45 minutes. Serve warm or at room temperature. To serve, put powdered sugar in a fine-meshed sieve and tap the sieve over the pudding, dusting it with sugar until the top is completely white. Serve each portion with a lemon wedge. Culinate editor's note: One pound of bread is the equivalent of 1 long baguette. However, since you'll be cutting off the crusts, try to use a wider and shorter loaf of bread, so you'll have less waste. (You can also buy two baguettes, of course.) If you find that you just can't bear to part with the crust (although it makes excellent breadcrumbs), simply crumble it well with your fingers in step 4. Read more in Kelly Myers' article about repurposing old bread.